** Outies - The villagers that came when the Wish Dragon wished them to the Land of the Fae. They are Villagers whom had been "outside the realm of magic". ​“I am bored!” uttered the youngest Fae as he sat and pondered what to do. “There hasn't been anything fun to scare… or anyone to help get lost on a path for ever so long,” he grumbled. “I know... even dropping cones from the trees on the tree frogs sounds boring,” said the second Fae. ​The others sat and tried to think of something to do, but each time one of the Fae would offer something, the others thought it would not be very interesting and so they continued sitting and being bored. “Why would they want to do that?” asked the second Fae. ​The youngest Fae (and there is nothing scarier than a bored Fae when a spark of inspiration strikes) said “Let’s all go as the same thing. That way they will really be confused when they see us. It will really boogle their minds if they see one of us just after they thought they just saw us somewhere else. I know just what we can all be. Before we left the Village, an Outie was telling me about how he missed his horse. ​I saw in his mind a four legged animal that looks like it could be fun being.” Shortly all of the Fae agreed this was a good idea. Since none of the others had a clue as to what a horse looked like, they all copied the youngest Fae when he changed. 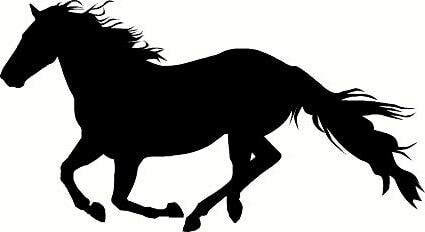 Soon a herd of horses, all black as coal, were running towards the Village. ​As they ran through the woods in the moonlight to reach the Village, the oldest Fae reminded them all that they needed to be back before the moon set or the King of the Shadow’s Realm would know they had been out causing mischief and would not be very happy about it. “And you all know what that means,” he told them as he finished. The other Fae did indeed know what that meant – more boredom and not being able to go out at night for fun for quite a long while. ​Soon the Fae were in the Village, moving from campfire to campfire, anywhere that there were Outies gathered so they could listen to the tales being told. Some of the tales were about the Outies’ past and what they did before coming to the Realm of Wymsy, but not all. ​Soon the Outies started to notice the horses. “I thought I just saw that horse outside of the Inn,” one Outie told another. “It couldn’t have gotten over here so quickly.” “Oh, stop talking like that or you will be giving me nightmares,” replied another of the Outies. The disguised Fae were beginning to think that this was their greatest idea of getting rid of boredom that they ever had. “I wished we could be like this forever,” one of the Fae said out loud to himself as he watched the confused Outie stare at him. ​How three little words can change the world. So can one – that is the word ‘forever’. Forever is a very long time and anything that is forever can be both a blessing and a curse. ​As the Fae uttered ‘forever’, a Wish Dragon just happened to be listening. He was enjoying the tales that the Outies were telling around a campfire, eating a Moon Flower (as the Dragons love eating them just like candy), and was in an extremely good mood. At the precise time the Fae uttered ‘forever’ the Wish Dragon agreed. Remember, Wish Dragons are very literal and accidents do happen. This instant was no exception. The Wish Dragon magic surrounded each of the disguised Fae and forever changed them, but the Fae did not yet notice this change. Only a young Fae, one who stayed behind in the Village when the others left for the Shadow's Realm, had been watching the horses and saw the Dragon's magic. ​Soon, the night was almost over and the moon was starting to set, so the Fae began their return home. “Don’t change from being a horse until we get back, shouted back the third Fae. That way if anyone sees us, no one will know it was us." As they passed thru the mists at the entrance to the Shadow’s Realm, one of the disguised Fae suddenly had an urge and picked a Moon Flower. Before he realized it, he was slowly nibbling on the flower and enjoying the taste. Now, Moon Flowers gets their name from blooming only in the light of a full moon. Anyone (Fae or Beast) gets near enough to smell them, let alone taste one, gets a little moony and sleepy. ​Only Dragons are known not to be affected by the flowers. When the other Fae saw that one of them was eating the flower they were all shocked. The Fae, still chewing on the flower, just shook his head and told the others, “It tastes so-o-o really good.” Soon, the Fae realized they had been watching the one eat the flower for so long that they forgot to change back from being horses to the Fae they were before the night started. When they tried, nothing happened. As they kept trying to change, they heard a noise in the trees and quickly thought that the King must have caught them. Maybe this was what was stopping them from changing. Out of the bushes came only the young Village Fae who had followed them into the Shadow's Realm and was now staring at them. “Nice horsey” he said as he touched one of their noses. It was at this point that the King did appear. ​“Nice horsey,” the Village Fae said again as he touched one of their manes. When the horse stepped away, the Village Fae started to get mad and his face turned crimson red. He did not scream or holler, he just stood there looking at the horses until another one came nearer and he could again touch the horse’s mane.